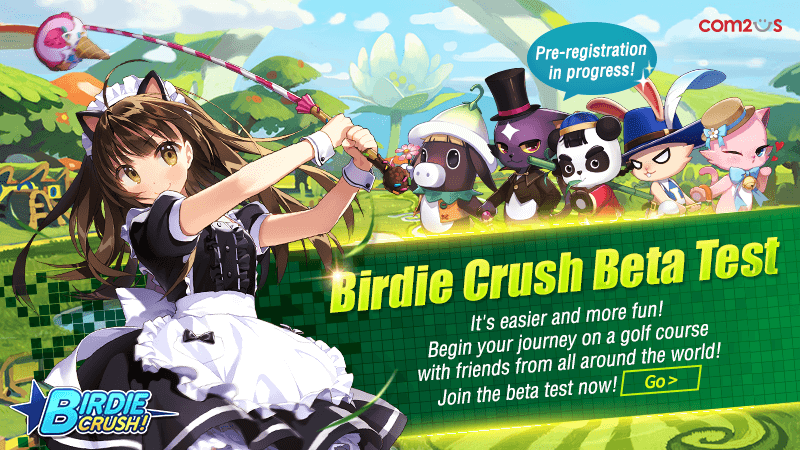 Finally, the world’s best golf game, Birdie Crush, begins its pre-registration for the beta test! Before we open up the beta test to you all, we’d like to encourage you to sign up for the beta test pre-registration! Pre-register for our beta test now and share this great news with your friends as well! Super adorable Caddies and beta test exclusive items await you! Don’t miss out! → Get a Caddie Box + 300 Crystals! → Invite 1 friend to earn 25 Crystals, and invite 3 friends to earn 100 Crystals! In addition, more events will be held in our official community, so make sure to stop by every day! 1. Only Android users can join the beta test. 2. Beta test pre-registration Participation Reward and Friend Invite Reward will be sent to your e-mail once the test begins. 3. Beta test pre-registration Participation Reward and Friend Invite Reward can only be used during the test. 4. Event rewards may not be given properly if you fail to receive our e-mail due to spam settings or change of e-mail address. 6. Participating in this event through any unauthorized method may disqualify you from the beta test reward. 7. For questions or customer support, please contact our Customer Support by visiting http://www.withhive.com/help/inquire.